If you are having difficulty finding your affiliate link for Step 7, these instructions should help you! This is your unique affiliate ID. This will either be a number (like the screen above) or the referrer ID you entered on sign up. You are now signed up to the affiliate program and ready to run the software. Wrap your product as normal, when you make it to the affiliate stage, enter your affiliate ID as shown in the screen below - remember enter everything AFTER the "aff=" part of the link! 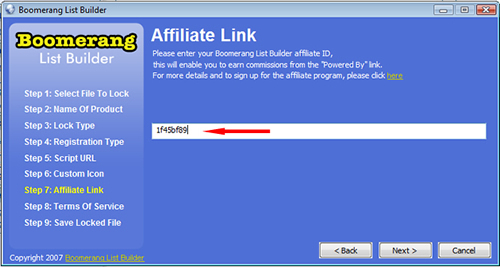 If you are using v1.2 of the software, the affiliate section will look slightly different. In v1.2 you have the option to not use the affiliate link at all. If you would prefer to disable the affiliate link, simply click on the "No" radio button.